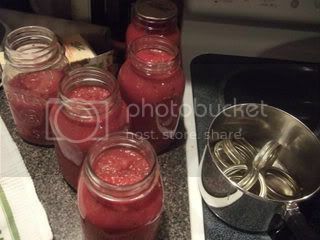 Since I began gardening seriously, 5 years ago, I have aspired to grow enough tomatoes to make a years supply of tomato sauce. The first couple of years I planted tomatoes en masse, figuring quantity would do the trick. Being able to handle 40+ Tomato plants be damned, I was going to have my sauce. I finally learned to narrow down variety, grow the plant for the intended use, space them properly and take care of them!! What a novel idea. This year I planted three varieties, had amended my soil well over the last couple years with organic fertilizers, lime, compost, and cover crops. I have 16 San Marzano plants, three Brown berry, and three Cherokee . I have had a stellar tomato season. After an early summer hail storm which damaged a few things and slowed a few other things down; the 'maters recovered nicely and flourished. 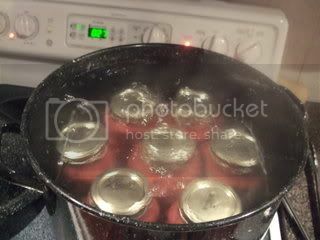 the following photos are of my sauce adventure. process for fun. Will someone please slap Chef boy'Ardee !!! let's begin with a big harvest. 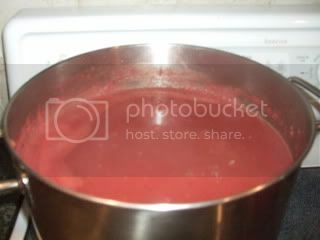 I processed the tomatoes in a blender, skins seeds and all, its all good!! 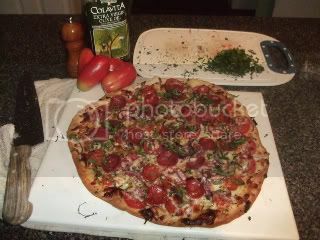 ohh yeah..I almost forgot... here's another good idea when you have fresh tomatoes to slice and basil in the garden. 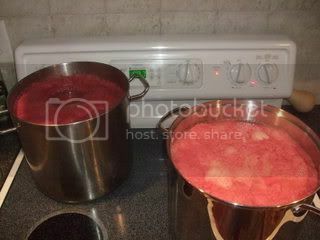 25 pounds of tomatoes equaled about 22 qts of pureed tomatoes, which i cooked down by half to make a thick sauce. The Yield was 11 3/4 qts. which with one more harvest should yield me about 22-24 qts. for the season. I must say I am VERY impressed. 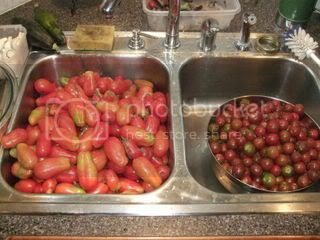 I too am a big Cherokee lover, however,.. the brown berry cherry toms are some of the best I have EVER tasted. I cannot wait o be the recipient of some of that deee lish looking sauce via a gourmet pizza! 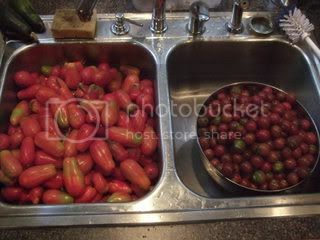 That sink full of toms looks amazing! 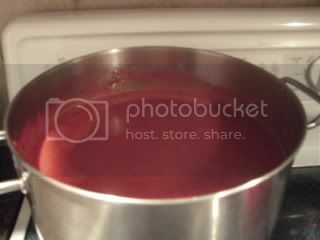 and the sauce looks very very nice! Well I think you can safely say that you have certainly proved that you can grow tomatoes without a problem - very impressive. 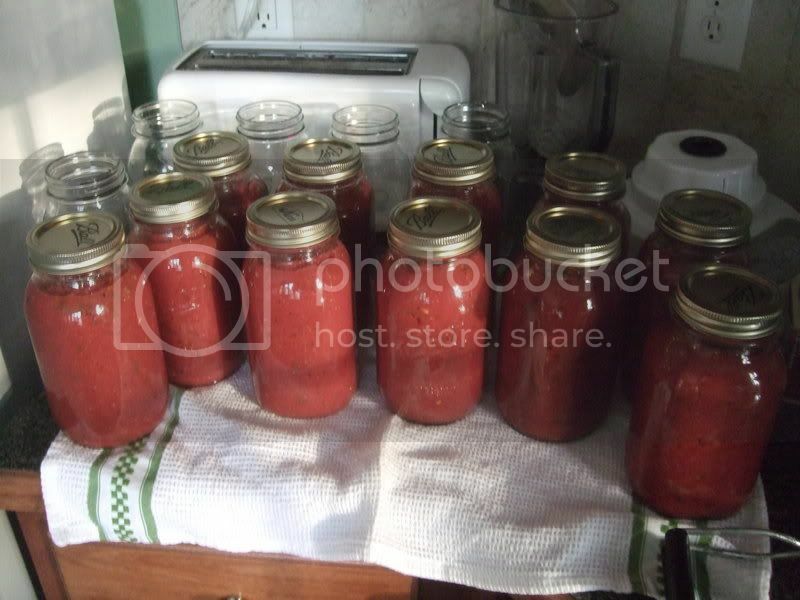 Will 22-24 quarts be enough for a years supply of tomato sauce then? Dude, you rock! 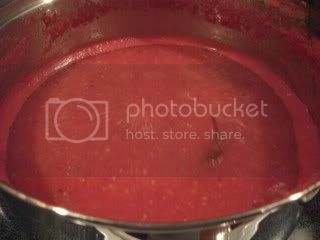 Is that straight up tomato sauce or do you season it up before you jar it? That's a fine looking pizza there too!! Of course, those in the know, know that amongst his many culinary atributes, Todd is a stellar pizza man!! Bravo!